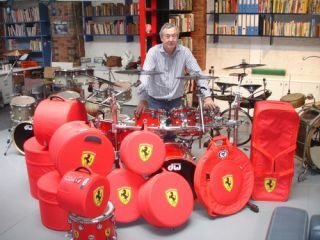 The iconic sticksman called on the company to come up with cases for his DW Ferrari and Dark Side Of The Moon set-ups. For the Ferrari kit (which features the Italian supercar's trademark red finish and logo) Nick wanted a set of cases to match (as well as a hole in each so he could spot his beautiful kit while it was safely snuggled up in its bag), and as you can see by the picture above, the final result looks pretty special. Nick's Dark Side Of The Moon kit and bags (above) are equally stunning, featuring the artwork of the legendary album of the same name. Is this the next big thing for drummers? Cases that look just as lush as the kit itself? If it's all as easy on the eye as this, then we're all for it.